搶先看:2018 Rittenhouse Game of Thrones Season7 冰與火之歌權力遊戲 第7季 影集收藏卡 - 球員卡相關消息區 - 育盛球員卡(球星卡)及各類運動討論區 - Powered by Discuz! 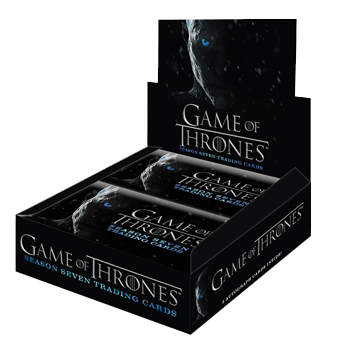 Full, factory-sealed box of HBO's Game of Thrones Season 7 Trading Cards (24 Packs). Each box includes 2 Autograph Cards, plus a full base set with cards for all Season 7 episodes and more than 50 key characters! Also, look for randomly inserted Sketch Cards and Relic Cards, including our first-ever dual relic card of Daenerys Targaryen! Bonus cards include: 81 parallel base cards (1:3 packs) 81 GOLD parallel base cards (1:24 packs) 9 "Quotable" Game of Thrones cards (1:12 packs) 10 Game of Thrones Relationships cards (1:24 packs) 10 GOLD parallel Relationships cards (1:144 packs) 7 "Beautiful Death" art cards (1:42 packs) 7 GOLD parallel "Beautiful Death" art cards (1:288 packs) 12 "Winter Is Here" Poster cards (1:144 packs) 9 Metal Valyrian Steel Expansion cards (1:96 packs) 9 GOLD Metal Valyrian Steel Expansion Cards (1:288 packs) Autograph Cards (1:12 packs) - including nearly two dozen first-time signers!